I'm just back from a road trip that knocked my socks off. I drove, with two friends, to a remote ranch in southeastern Oregon, near Steens Mountain. 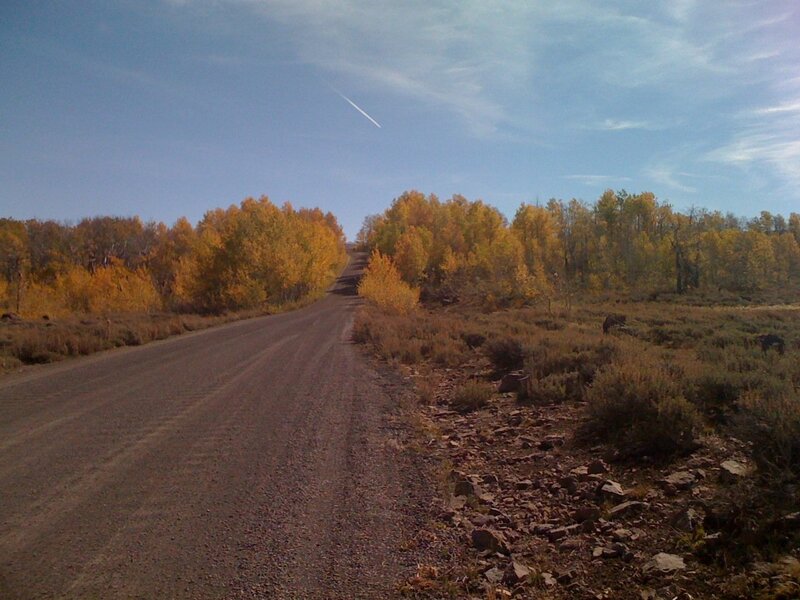 (The above photo was taken on the gravel road up to the summit if said mountain. 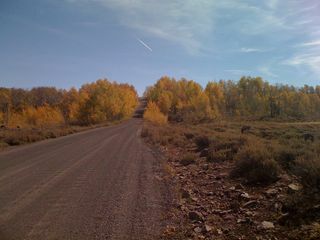 The Aspens were peaking and unbelievably gorgeous.) This part of Oregon is very different from the west side, which is lush and green. Instead, we were in high desert country, basin and range, where wild mustangs still roam and we saw at least 30 different kinds of birds, including a great horned owl, whooping cranes, a bald eagle, grebes, and mountain bluebirds. Excuse the sideways image, I don't know why it is loading that way. 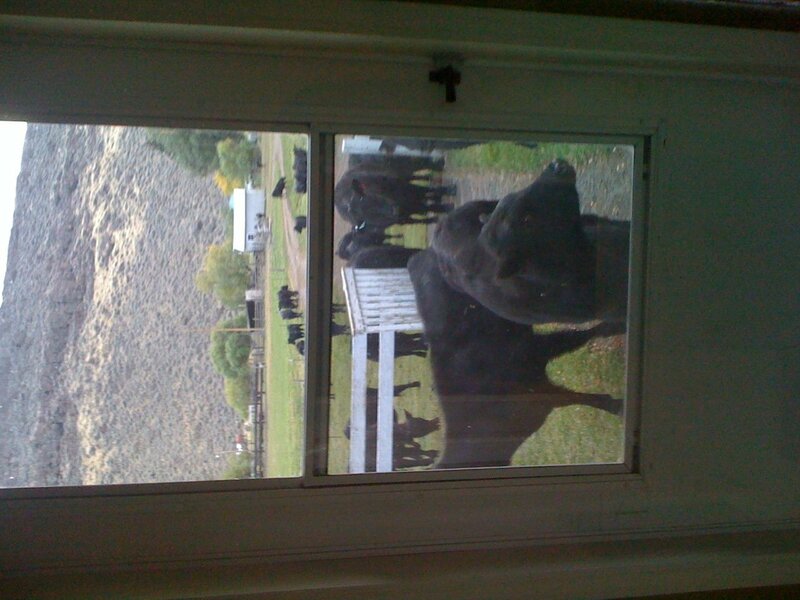 At any rate, this is the cattle looking in the front door of the ranch house. Crane your neck to the left and note the gate in the background, which, being city girls, it didn't occur to us to close. So we had a lot of fun herding the cattle out from the backyard and back into the front pasture. They went every which way, over the fence, leaving fur behind, and under it, breaking down a couple rails along the way. One even went under barbed wire. 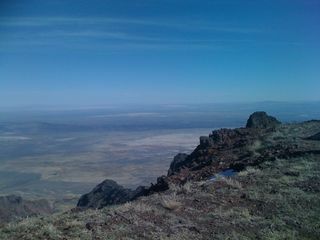 From where I'm pretty sure you can see Idaho and Nevada in the distance, hundreds of miles away. It was colder than a witch's you-know-what up there, and windy as hell. But spectacular. 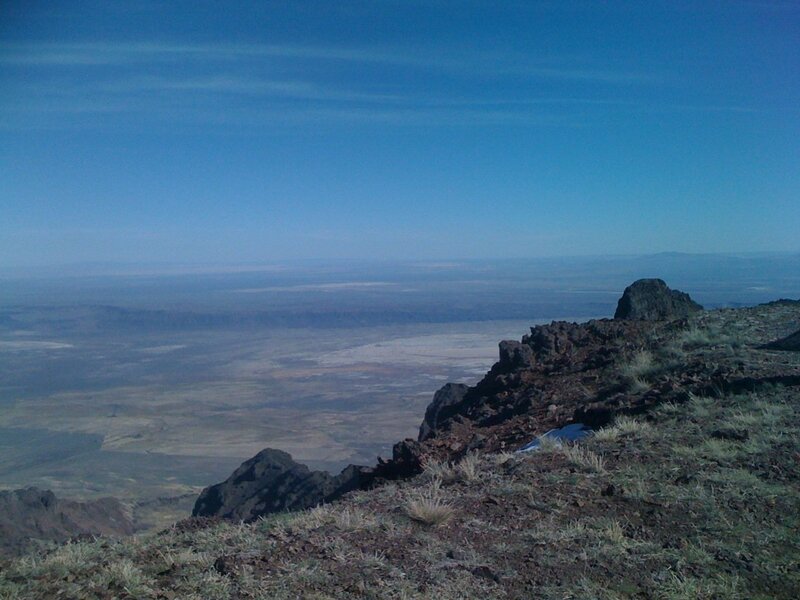 Oh, and all these years as an Oregonian, I thought it was Steens Mountains, plural, as in a mountain range. But it is one very long mountain, a fault-block mountain which makes it so. Which I did a wee bit of. But mostly I was too busy inhaling the grand vistas, spotting birds, looking for wild mustangs, and meeting fabulously interesting people during dinner at the Hotel Diamond, which has been in operation since 1898. Considering that its in a town with a population of 5 at the end of a road, its amazing and wonderful to me that the place is pretty much always booked up. By the way, the writer Ursula Le Guin stays at the same ranch house we did every year with her husband, and is so inspired about the place she just wrote a book about it, which you can buy here. And, in another by the way, a friend and I are planning a writing retreat for next year that we've been scouting locations for–and this might just be the place. So stay tuned for more details about that. 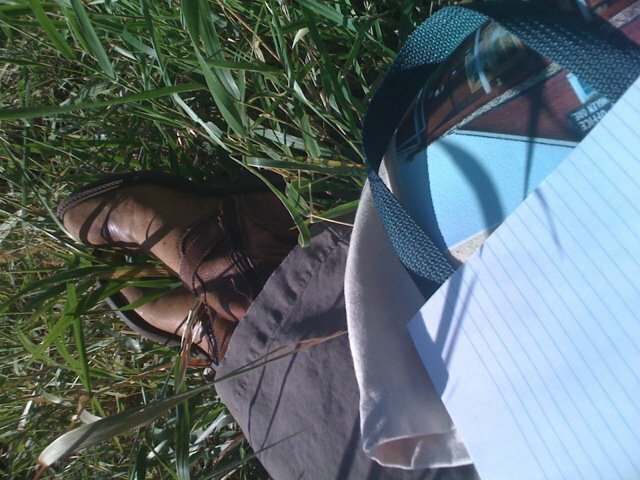 When I did have a small amount of time and sat down in the grass by Benson Pond to scribble away, I intended to work on something I've wanted to get done for a long time–a new freebie to entice people to sign up for my newsletter. Its going to be a really good one, and I'm excited about working on it. But I found I couldn't. Why? Because I had too much new stuff in my mind to focus. 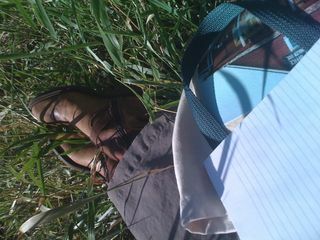 That day by the pond I wrote about what I had seen. 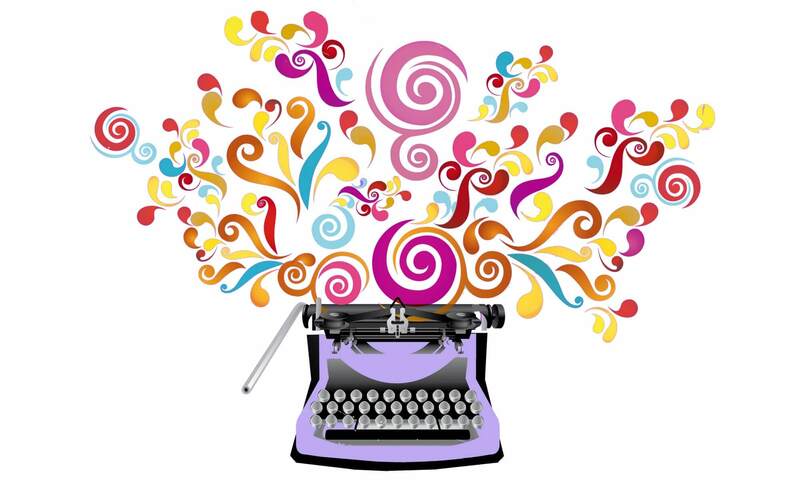 And even since I've been home, I've still been writing and processing. I've been engaging in a brain dump, getting every new experience and vista out of my head an onto the page, clearing the way to go back to my other work. 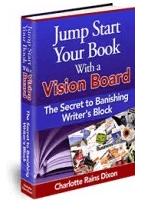 And now, after journaling and blogging about it, I'm starting to feel clear enough to write the freebie. So sometimes it is important just to allow yourself to do a brain dump. What about you? How do you process new experiences?